I could not get enough of Bewitched re-runs when I was a kid. I was in awe of Samantha Stephens with her magical nose and I wanted those powers for myself, darn it! I wanted to be her more than anything. More even than I wanted to be a Solid Gold Dancer. 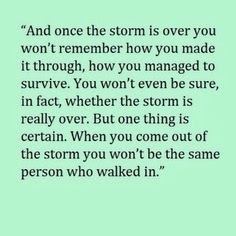 And that is saying A LOT. I would practice trying to wiggle my nose and can remember thinking that if only I could learn to do that, then the magic was mine! Through a child's eyes, I didn't see that she was married to a man whose self-confidence and manhood were threatened by this amazing, independent witchy woman he was married to. 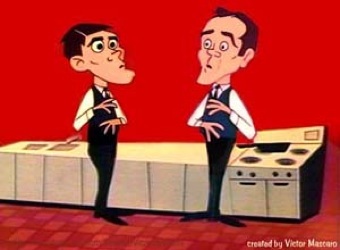 I was always confused as to why Darrin (both of them!) did not want her to, and demanded that she not, use her powers. Ever. He was one of those men of that time who felt that a woman's place was in the home, cooking and cleaning and taking care of the kids. She wouldn't be needing those magical powers anymore. Not now that she was married and all. ﻿﻿As a kid I just didn't have the wisdom or insight to get this. It always confused me. Did he not see how this could benefit him? Why would he want her to hide this awesome nose twitching magic? It bothered me when they were in a pickle that she could easily fix with one little twitch of the nose but opted not to use her power. I would be sitting on the floor in front of that giant floor model television with the 5 channels shouting at the screen....just wiggle your nose, Samantha! Why don't you just wiggle your nose? Please wiggle your nose!!! And, if you ever watched the show at all you know that she often did sneak around behind Darrin's back a time or two...okay, A LOT! I loved it when her mother, Endora, showed up although I did find her more than a little frightening, because you knew when mama showed up there was gonna be trouble and it was coming in the form of a magic show. She was the mother-in-law from hell that every man has nightmares of. But Samantha always stuck to her guns and Mama Endora would eventually leave and things would go back to normal. At least as far as Darrin Stephens knew. He had no idea that wife of his was really running the show because she always allowed him to believe he was. I didn't understand this as a child but looking back on it I see that Samantha Stephens was one smart little witch who was having her cake and eatin' it too by living the mortal suburban family life she always dreamed about as a little girl witch while continuing to work her magic all the while. And she did it all for love because although Darrin was threatened by the powers, he clearly adored that woman, just as much as she adored him. This post was written in repsonse to Mama Kat's writing prompt number 1.) A book (or tv show … or something) that you watched/loved as a kid, that you see through entirely different eyes as an adult/mom. I loved this show as a kid too. And my mom always said if she could just learn the side to side nose twitch she, too, could have done magic. I used to love that show too! Great post. stopping by from Mama KAt's! 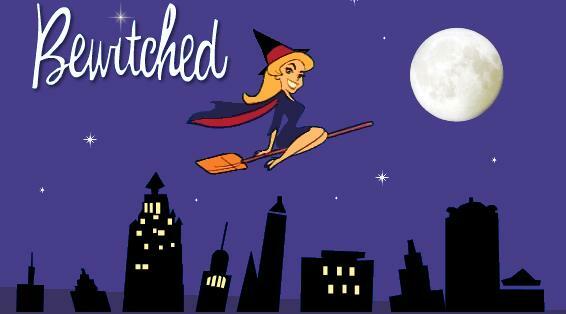 While I didn't really enjoy the magical show of I Love Jeannie, I sure did love Bewitched. Like you, I always wondered what the heck his problem was. Use the magic, buddy! But what you're saying makes complete sense. So smart! I never thought of it that way, but you're absolutely right, by forbidding her from using her magic, he was making her submit to his patriarchical will....oops, sorry, I've written one too many women's study papers. I always wished that I could do that nose twitch.